The STAMP project team participates in the Project Quality Day at EclipseCon Europe 2017, October 24-26, in Ludwigsburg, Germany. Join us on OW2 booth #9 during the conference to talk with the developers of our current collaborative projects. Benoit Baudry, Stamp Project coordinator and scientific leader (INRIA), showcases Stamp initial results, in a 35 minutes presentation for intermediate developers. DevOps puts a huge emphasis on test quality: while it promises to drastically reduce delivery cycles, hasty deployment entails the hazard of propagating a regression bug into production due to lack of sufficient testing. Statement coverage is the most popular metric to determine the adequacy of a test suite. Yet, this metric is known to be a poor indicator of a test suite's capacity to detect bugs. This talk will introduce and illustrate the benefits of another metric for test suite quality: the mutation score. The intuition of this score is simple: to determine if a test suite can detect bugs in a program, simply inject bugs in this program and check if the tests can detect them. the key principles of mutation analysis. 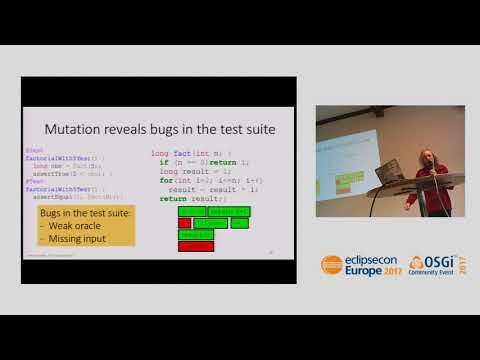 the Pit tool to perform mutation analysis on Java program to assess the quality of JUnit test suites. Read more in this technical paper by Benoit Baudry (KTH) Mutate and Test your Tests, and have a glance on his presentation and the associated video above.